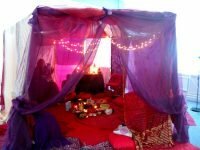 Sharing circles, meditations, workshops, dancing, music and laughing.We keep our website and Facebook group up to date with the latest events, locations and times as they can vary. Do you ask participants to bring anything, wear red or make a donation? : Wearing red is encouraged but not necessary. A donation of £2 per Red Tent is appreciated for expenses. A chance to connect with the wisdom of women in a unique space.